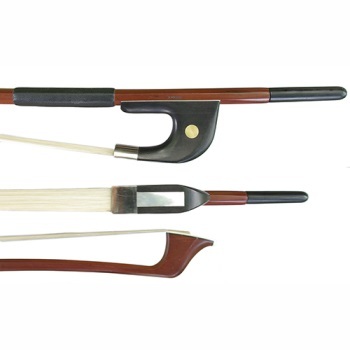 The pernambuco stick of this attractive bass bow is strong and stiff to allow for deep sound production, but still retains flexibility to allow it to facilitate off the string bowing techniques. This balance makes it a very flexible bow suitable for many playing styles, and it is bound to become a player's reliable "work-horse" bow. It features an all-leather grip, and the German frog is ebony with mother of pearl eyes and slide.